This morning CBC radio’s Morning North featured a segment on a recent donation to the Sudbury Archives. Hearing about community archival donations on local media is a rare occurrence so it was nice to see community interest in the Sudbury Archives. Details on the recent donation can be seen here. 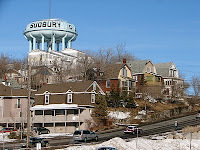 The Sudbury Archives was established relatively recently. In 2008 the city hired a professional archivist and the City of Greater Sudbury Archives opened to the public in May 2012. The Archives houses municipal government records as well as private organizational, business, and personal papers. Personally, I was surprised by the relative newness of this community and municipal archive. Naively I assumed that Sudbury would have long ago established an archives to preserve it’s documentary heritage — even if that archive was simply part of a local museum. The Sudbury District Archives Interest Group was instrumental in partnering with the City of Greater Sudbury to establish the Sudbury Archives. The Interest Group became concerned about the destruction of Sudbury land records and played a key role in advocating for a community archives. The portion of the holdings of the City of Sudbury Archives are available online via Archeion. The items that are available online are well described and include ample contextual information. Some of the online records also include images. A list of the microfilm available for reference in the reading room is also available online. One of the interesting (albeit a tad cheesy) parts of the Sudbury Archives website is a game called Grandma’s Attic which is designed to teach students about the difference between archives, libraries, and museums. The game is simple by design but is a great example of an interactive way to teach people about archives. I have a new post over on Activehistory.ca, “Sudbury: The Journey from Moonscape to Sustainably Green.” The post looks at the impact of mining on the environmental landscape in Sudbury and the ongoing efforts to repair the industrial damage to the land. Morning North recently featured a segment on the facebook page “Sudbury’s Fine Past & Future Let’s Reminisce.” The page aims to share photographs and memories of Sudbury. 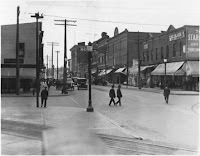 The page has over two thousand likes and over 50 photo albums focusing on all aspects of Sudbury history including theaters, hospitals, streetcars, and neighborhoods. The success of this historically focused initiative surprised me, I expected to see a page with lots of content added by a small handful of contributors and little discussion. Fine Past & Future seems to have an active and dedicated community of users and contributors who actively contribute and comment on photographs. A facebook page is definitely not an archive in the traditional sense. I suppose one could argue that this particular collection of photographs represents a snippet of a personal collection or a personal archive. Regardless, the comparison of a collection of photos to an archive isn’t what bothered me. The relegating of archives to serving only professional researchers is what didn’t sit well in my mind. Archives do a lot more than merely serve academic researchers. Archives help preserve the heritage of communities and aim to share that preserved heritage with the community. Many archives have started using social media in a way similar to the Fine Past & Future page–to share photographs and gain user generated metadata about unknown images. Archives also undertake the preservation of physical and digital content. That user generated metadata is being preserved by archives and not merely left up to facebook to keep safe. Those physical photographs of community landmarks, historical buildings and community gatherings are being preserved in acid-free sleeves and environmental conditions that are designed to limit deterioration. Yes, archives have traditionally been the domain of academic researchers. But genealogists, casual researchers and community historians are all welcome in many community archives. Many archives have created finding aids specifically to help with genealogy research or have reading rooms focused on local history. The users of archives are just as diverse as the content held by the archive. Archives need to continue to promote themselves, their services and their collections to the general public. The Marymount stairs in Sudbury, Ontario on Ste. 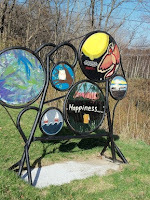 Anne’s Road are home to a community art project. The green stairs were once a safety concern for many local residents and many people did not feel safe using the stairs. Foliage has been removed and lighting increased to make the area more visible. Additionally, in an attempt to make this a safe community space the stairs have been home to a community art project for the past three years. 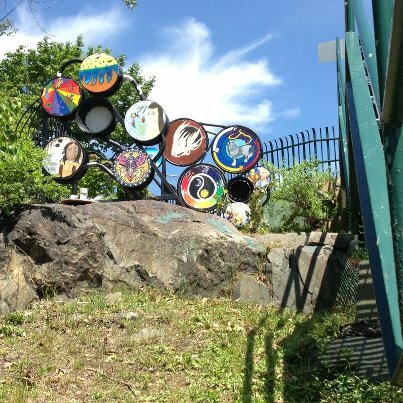 The idea behind this rotating art exhibit is that the artwork has the potential to increase traffic in the area, which helps increase safety levels. 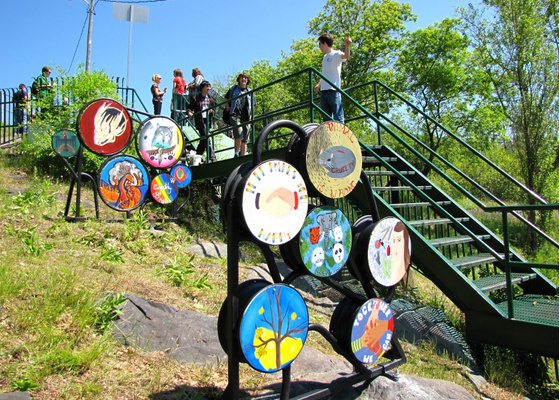 On the community level, organizers have encouraged local high school students to contribute works of art to the stairs. Each spring art work created by students which comments on social issues is installed around the stairs. A previously ‘scary’ space is now home to colourful artwork and a great sense of community. It is great to see community members working together to reclaim urban landscapes that have been neglected in the past. This week’s Northern Ontario historical image is of the Main Street of Sudbury, circa 1910. The image is from the Archives of Ontario and is part of the Photographs of the Audio-Visual Education Branch series. The Archives of Ontario also holds a number of historical maps of the communities within the Sudbury district. Many of these communities were eventually amalgamated to form the City of Greater Sudbury in 2001. The majority of these maps can be found in the Parent plans series, which contains maps showing the status of crown land from circa 1785 to 1970. 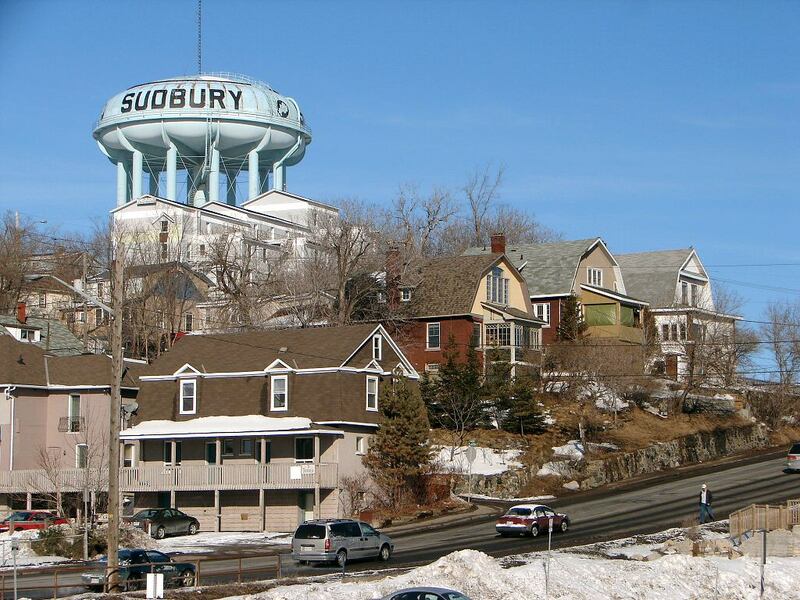 Sudbury is currently home to two iconic water towers, one on Pine street and the other on Pearl street. Both towers are in a state of disrepair and a debate over their restoration or demolition has been ongoing since 2008. The second water tower, located on Pearl street has a completely different fate. Media Mobile Advertising bought the property surrounding the Pearl tower last fall. Media Mobile Advertising has submitted a proposal to convert the water tower into a commercial facility. This conversion would be similar to the one undertaken in Lethbridge, Alberta. It will be interesting to see if this project comes into fruition. The Moulin à Fleur neighbourhood Sudbury located immediately north of the downtown core was one of the first neighbourhoods to develop outside of the original settlement. The most well known landmark in the area is the flour mill which gave the community its name. The mill silos will be 100 this year. This mill has long closed and the mill’s silos were designated a city heritage site in 1973 and recognized under the Ontario Heritage Act in 1989. Additionally, the mill’s foreman house was converted into a community museum in 1974. Despite these positive preservation efforts the flour mill landmark in Sudbury is in a state of disrepair. 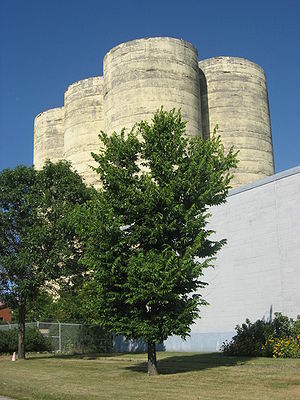 The silos that the city has previously deemed a heritage property have received no maintenance work in many years, and the entire structure is nearing a state of demolition by neglect. The neglect of the silos has left the city with a choice to either repair or demolish the silos, as they are becoming a safety hazard. Demolition costs have been estimated at $520,000 to $850,000, and refurbishment at $1.7 million. However, based on the age of the silos there are a number of heritage grants which local organizations are applying to in hopes of helping finance the repair. Many Moulin à Fleur community members see the mill as been a valuable part of their local heritage and are against the demolition of the silos. Hopefully the city can be convinced of the value of this local landmark.